A mother sees her child bullied online and in person, and asks the Geneva police for help. Her alarming story includes serious allegations of misconduct by the GPD. Michelle Wilcox grew up in Geneva and now lives in Waterloo. “I wasn’t born into a wealthy family and my children were never fed with a silver spoon,” says Michelle. She is the mother of three, aged 18, 16 and 13. Her oldest (a son) has graduated high school, while her two daughters are both honor roll students who are also involved in athletics. Michelle readily admits that her kids aren’t perfect, but in the next breath, she gushes about how proud she is of all of them. Then she looked further into the teens’ conversation. Gun photo provided by Michelle Wilcox, who says this was one of multiple images of guns sent by a Geneva student to her daughter and others. Over the coming days, Michelle says bullying of the Waterloo girls continued. On September 22nd, Lisa was sent an online video that had been posted on multiple social media platforms (including SoundCloud, Instagram, Twitter and Snapchat). Three young males from Geneva had created and posted a 2+ minute “dis” video, with the youths rapping about their disdain for Waterloo, specifically naming Lisa and several of her schoolmates. The lyrics aim degrading sexual comments toward the Waterloo girls (who are, keep in mind, around 13 years old). The “rap” also mocks some of the girls’ physical appearances and family histories. WARNING: The following audio link contains graphic language and adult content. All names have been removed from the song. 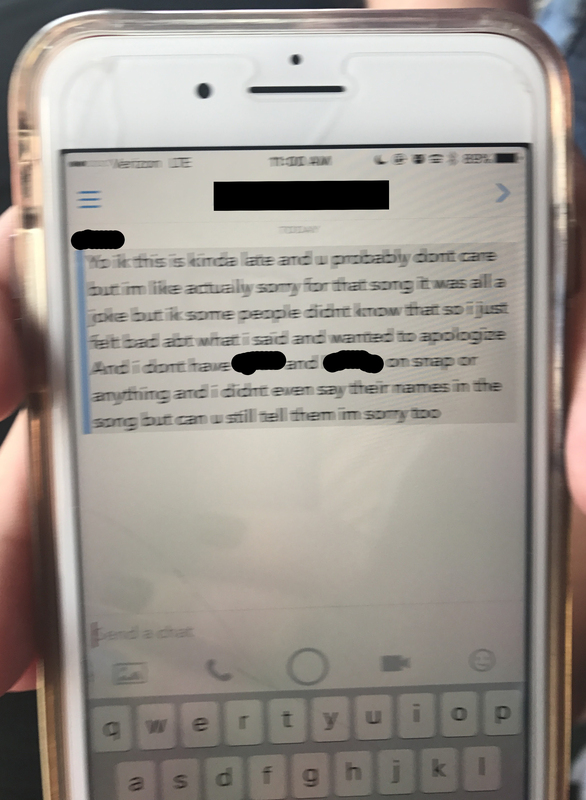 She immediately called the parents of the other girls mentioned in the video, and then called each of the teenage boys and asked for their parents’ phone numbers (not unexpectedly, the boys would not share that information). Michelle says she visited the homes of two of the Geneva youths involved in the rap video. At one house, she spoke with a father, who was apologetic. At the next house, Michelle found that one parent was working and another out of town, but she spoke with them both on the phone. The next day, Saturday September 23rd, Michelle attended a JV football game in Waterloo, with Geneva the visiting team. Michelle says a young man she didn’t recognize as a Waterloo student sat behind her on the bleachers and proceeded to yell obscenities and derogatory sexual comments Lisa and her friends, who were sitting near Michelle. After being confronted by Michelle and other parents, the boy left. Later that day, Michelle continued knocking on doors in Geneva, and spoke with the parents of one other young man. But her search for rest of the parents came up empty. “I tried every other house but they knew I was coming and no one would answer,” said Michelle. At this point, due to the severity of the threats, Michelle and the mother of another girl named in the video decided to go to the Geneva Police. Because Michelle was already in Geneva, she went to the police station. “I drove to the PD and pushed the button,” she said. She told them why she was there, and an officer was sent out to meet her. That evening, Geneva hosted in a varsity football game on the Hobart and William Smith campus. Michelle, her nephew and daughter sat by themselves. At one point, Michelle says a young boy approached and told Michelle (not Lisa),”that girl said she will pay me $5 to slap you in the face.” Later, a teenage girl (age 17) followed Michelle and her family members to their car, shouting obscenities and threats. Michelle says the school resource officer saw this incident. “Numerous people saw this including (School Resource) Officer Arroyo,” said Michelle. Three days later, according to Michelle, the Geneva officer who spoke with her a few days earlier called back. Photo by Michelle Wilcox. Michelle says she provided the GPD with the address and phone number of the student who sent gun photos. The report does not include this information. And that’s when Michelle says she drove directly to the Waterloo Police Station. Once there, she says she spoke with an officer who was attentive and accommodating. “He wrote everything down and saw all the same photos…the gun photos as well. He suggested I go to the Waterloo School Resource Officer,” says Michelle. She said the officer stated that a Sergeant from Waterloo PD would be contacting Geneva PD. Michelle says she called the Geneva School District main number and asked to speak with Officer Arroyo. He was unavailable so she left a message. That afternoon, Michelle discovered that she missed two calls and one voicemail from a Geneva Police Department detective. She returned the call and left a voicemail. 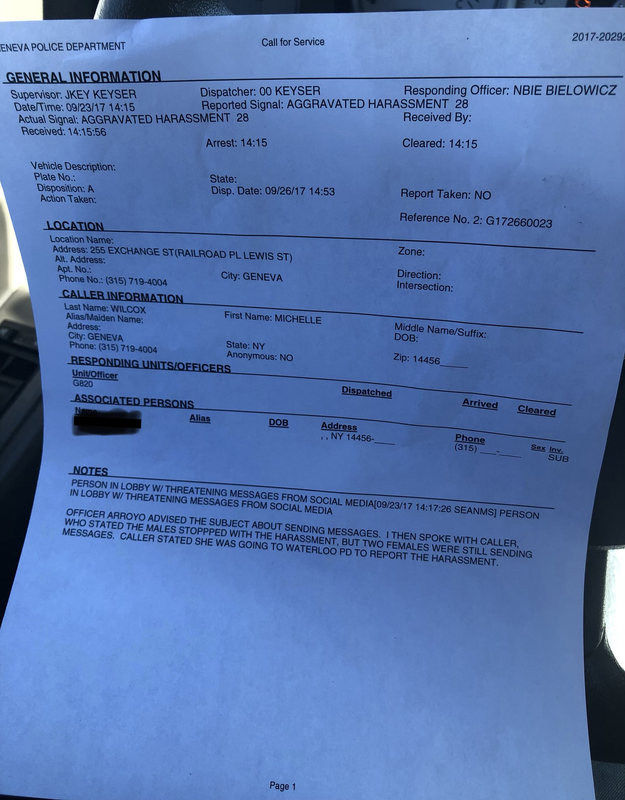 The next day, September 28th, Michelle says the officer told her that he was calling because “multiple families” had accused Michelle of harassment. According to Michelle, Detective Choffin stated that she was on one family’s home surveillance footage at least six times, threatening and harassing them. Michelle said Choffin told her that it the accusers claimed that Michelle had brought her nephew (who had a full leg cast at the time) to fight their son. When, according to Michelle, she asked Choffin how to file a complaint against a police officer, he told her “start at the bottom of the ladder” and laughed. Geneva Believer has reported on the police complaint process in recent weeks. The next day, September 29th, Michelle’s older daughter texted from school and said she had been called to the guidance office. Moments later, the same daughter called in distress, and said there was a woman from CPS (Child Protective Services) there to talk to her, and asked Michelle to come and get her. Michelle says that Lisa later spoke with the CPS worker, who asked about videos that purported to show Lisa fighting people from Geneva, which Lisa knew nothing about. Later, according to Michelle, the CPS worker visited her at home, and Michelle explained the bullying situation. The worker asked Michelle to email all the information, which Michelle did. The next day, September 30th, Michelle says that her step daughter had all of her social media accounts hacked. Someone had changed her profile photos to vaginas. Michelle says she called Waterloo Police and filed a report. The next day, October 1st, Apple sent a message stating that the accounts were hacked by someone in Geneva, NY. The next day, October 2nd, Michelle emails the school superintendent and asks for a meeting. The next day, October 3rd, the superintendent responds and refers Michelle to School Resource Officer Arroyo. Michelle responds via email. That same day, Waterloo junior varsity and varsity soccer teams had home games. Neither game was against Geneva, yet Michelle says that one of the students from Geneva involved in harassing Lisa showed up with her mother. This mother and student, according to Michelle, are related to a Geneva police officer. They never approached Michelle but Michelle still reported it to the school’s athletic director. The next day, October 4th at 1:00pm, Michelle says she got a message from Lisa’s soccer coach that all games against Geneva had been cancelled. Michelle has also contacted her state legislators. When it came time for her to fill out a complaint against Detective Choffin, she couldn’t find a complaint form on the police department’s website. She didn’t feel safe going to the police department to get the form herself so she sent someone on her behalf. She said this person was asked his name and other questions about why he wanted the report. Michelle also says she is contacting the NYS Department of Education and “parents who have lost their children from suicide due to school or cyber bullying. On October 11, one week after Michelle gave him her contact information after he offered to meet with her to discuss the issue, Geneva City Manager Matt Horn called to schedule a meeting with Michelle. Next Geneva Believer Goes Trick Or Treating! the issues that i have dealt with for about 3 years wi th bullying. my son seem insignificant after reading this. I didn’t get the school districts attention until I contacted to nys board of education in March of this year. they immediately voluntarily pulled my son from school and tutored him….still rather than dealing with the issue. this is why I have been vocal in our district as my son said I am done…we could have lost him to suicide if we hadn’t been on alert already, if we hadn’t talked regularly or knew what his situation was. so many kids don’t tell their parents when bullying happens and we need to protect our kids!